Word for word, Dragon: Age Inquisition is the largest story BioWare have told to date – and they once secreted eight RPGs-worth into an MMO. Inquisition’s dialogue now totals nearly a million words, distributed throughout some 150 hours of moral dilemmering and tactical pondering. The game was demoed before the announcement of Shadow Realms at GamesCom this morning. 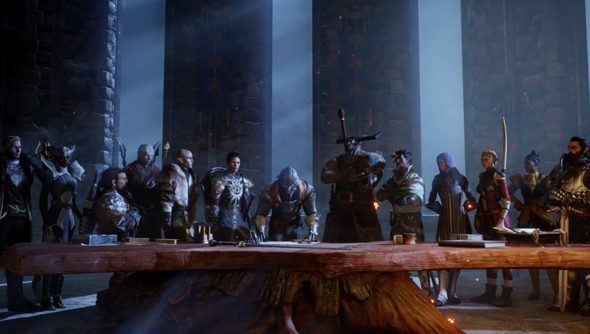 BioWare Edmonton and Montreal GM Aaron Flynn told his audience that it was “up to you to lead or the world will fall” – which seems like an awful lot of pressure to put on a gaggle of jetlagged games journalists. “Story lies at the heart of every BioWare game, and Dragon Age: Inquisition is no exception,” he said. “With almost a million words of dialogue, it’s the biggest story we’ve ever told. In fact, a recent completionist playthrough clocked in at well over 150 hours. Inquisition is the “biggest and most ambitious game we’ve ever made at our studio in Edmonton,” said Flynn – no small claim, given that BioWare Edmonton built Baldur’s Gate 2 and Dragon Age: Origins. Inquisition’s GamesCom demo sees somebody name an axe ‘All the Feels’, but only gets better from there. It concerns a mission to rescue soldiers from a castle razed to the ground, while dodging peasants raised as undead – and shows the player switching seamlessly between absent-minded sword-swinging and a tactical camera strongly reminiscent of Baldur’s Gate. The tactical camera seems agreeably necessary in the tougher fights. As one of Inquisition’s nine companion characters says in this trailer: “If we are to withstand this monster we must control the battle”. Hmm. This is probably going to be brilliant, isn’t it?